There’s an unofficial Zombies, Run! podcast now – Zombies, Run! Since the start of Season 3 we’ve seen a huge resurgence in fan activity — clearly these new missions are inspiring you! So much so, in fact, that some Zombies, Run! fans have started a regular podcast. The aptly-named Podcast Detected is only a couple of episodes into its run, so this is the perfect opportunity to get in on the ground floor. You’ll be in the safe hands of megafans collected-sports-bra, zalia, devbneo, nonchalantmemories, elevengeronimos and the-illusion-of-sanity as they discuss the latest missions and other Zombies, Run! goings-on. Episode 1 is embedded above and you can find Ep 2 on the Podcast Detected tumblr page. New episodes are promised regularly! We’ve also found a couple of pieces of great Zombies, Run! fan art. 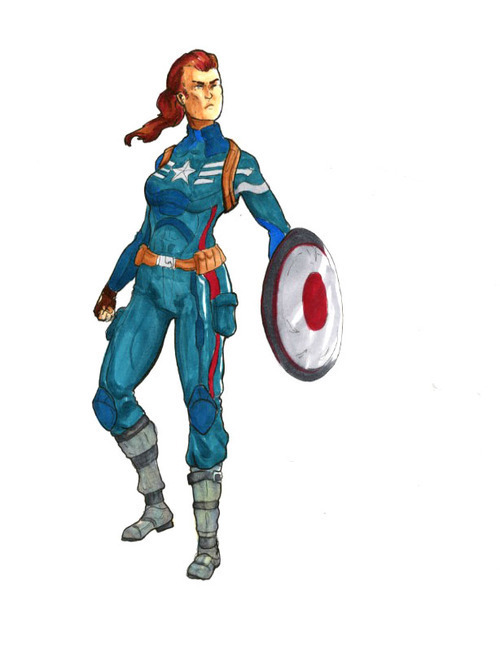 Here’s a brilliant pic of Janine dressed up as Captain America (based on Zalia’s fanfic) as drawn by Crownleys. We’re looking to put together another Zombies, Run! Fan Roundup soon, so we need you to let us know if you’ve created something awesome (or seen something awesome someone else has created). It could be art, fiction, audio, tree carving or even just a cloud you think kinda looks like Sam Yao. Previous Post What’s new in the latest version of Zombies, Run!